I'm one of those people who love taking online quizzes - you know the ones, where it tells you which superhero you'd most be like, or which colour abandoned crayon you'd be. They're fun and I love how absolutely random they can be. 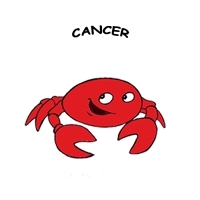 Anyway, I'm not a big believer in astrology, but that must be how they got this one, it's 'what does your birth month say about you' and it's the same sort of stuff they tell me because I'm a Cancer. It's eerie sometimes how close they get.